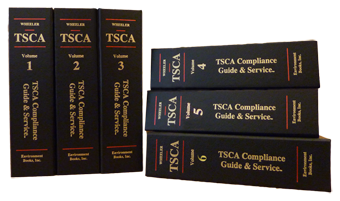 Toxic Substances Control Act Compliance Guide and Service - Environment Books, Inc.
"The world's leading source of up-to-date TSCA information"
Copyright© 1988-2018 by Environment Books, Inc. The graphics and documents contained on this World Wide Web site are the copyrighted work of Environment Books, Inc. and also contain proprietary trademarks and trade names of Environment Books, Inc. You are hereby authorized to copy documents published by Environment Books, Inc. on the World Wide Web for non-commercial use within your organization or for educational or research purposes only. In consideration of this authorization, you agree that any copies made of these documents shall retain all copyright, trademark and other proprietary notices contained herein and therein. The copies may not be sold or incorporated into commercial documents, whether for profit or not, without the express written consent of Environment Books, Inc. Copyright © 1988-2018 by Environment Books, Inc.